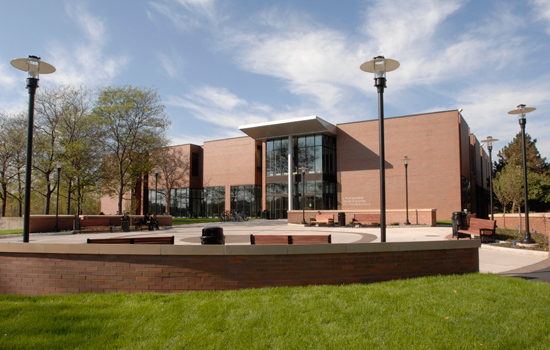 The E. Philip Saunders College of Business continues to advance its reputation as a national leader in undergraduate, graduate and executive business education at Rochester Institute of Technology. During a ceremony on campus today, entrepreneur E. Philip Saunders, owner of Saunders Management Co. and founder of TravelCenters of America Inc., announced his commitment of $5 million to the business college bearing his name—to expand the school’s facilities, enhance technologies, create three endowed professorships (Product Innovation, Service Innovation, Financial Innovation) and offer six graduate fellowships per year for exceptional students. 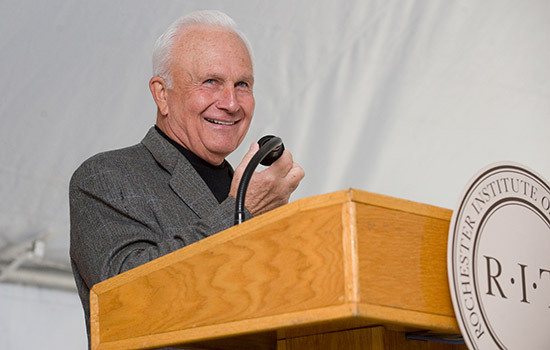 In establishing the gift, Saunders announced a challenge to all Saunders College alumni and friends to come together to raise a total of $20 million to support the college’s visionary plans. It comes four years after Saunders' initial gift of $13 million to the college. Saunders believes his monetary challenge to the more than 17,000 alumni from the Saunders College is a call to action. “Educational opportunities are key to advancing America’s leadership in the global economy,” he says. One of eight colleges at RIT, the E. Philip Saunders College of Business enrolls more than 1,200 undergraduate and graduate students. The Saunders College and its entrepreneurial learning facility, Venture Creations, work in partnership with RIT’s Albert J. Simone Center for Innovation and Entrepreneurship to integrate business education with RIT’s world leading technical and creative programs. Graduate programs include Master’s of Business Administration, MBA-Accounting, Executive MBA (now also online), and master’s degrees in finance and administration. Saunders College undergraduate and graduate programs are fully accredited by the Association to Advance Collegiate Schools of Business International (AACSB International), the premiere accrediting organization for business schools. Only about one-quarter of the institutions granting business degrees have received this accreditation.